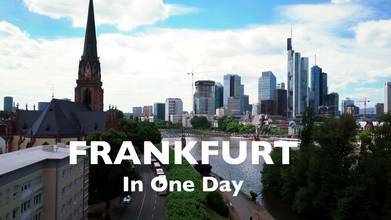 Nohesitations used a combination of drone and ground camera footage to record this chronicle of a brief trip to Frankfurt, in western Germany. Frankfurt is on the Main River (the largest tributary of the Rhine), in the state of Hesse in west-central Germany. It's the fifth largest city in Germany, and the third largest in western Germany after Hamburg and Cologne. It's known best of all for being a financial center, by some measures the second largest in Europe after London. Description: NOTICED IT'S BEING STREAMED AT 720P HERE. Please GO to Youtube to view it in 4K. I had a 10 hours layover in Frankfurt 🇩🇪 from Noon to 10 PM. Took a quick ride to the city and I couldn't resist to fly my DJI Mavic Pro to take some nice footage of this beautiful city. It was great weather, around 25 Celsius and there’s not much wind, perfect for flying 😃. Drone footage was filmed in 4K using ND16 filter, other footage was filmed with GoPro Hero5. Hope this will persuade you to visit Frankfurt, one day is a good start. I wish I had more time so I could stay for a couple days, at least, to explore the food scenes and other attractions. Taking advantage of a long layover to check out a city is not a bad idea at all. I never thought it would be enough time and boy I was wrong. I will certainly do that again whenever I get a chance. Happy safe travel! Don’t forget to “Like”, “Comment”, & "Subscribe"
Music by Dj Quads “Early"